Council Officer Stan Keable (Labour Party Marxists) Suspended Amid Allegations that he said ‘Zionists’ ‘Collaborated’ with the Nazis. Alleged to have said Zionists “collaborated” with the Nazis. Stan, an indefatigable supporter of the Weekly Worker, is well known on the left. He comes from an old Communist family. I knew his brother Ken, as an adolescent, in the Woodcraft Folk. That he should be threatened with the loss of his job for views on ‘Zionism’ that owe a lot to Moshé Machover – ones I heartily disagree with – is outrageous. This Blog backs protests against this move. London council officer suspended after claiming Zionists ‘collaborated’ with Nazis. A London council worker has been suspended after being caught claiming Zionists “collaborated” with the Nazis. The Left-wing activist made the comments, shared in a clip on Twitter, at a demonstration outside Parliament led by the Board of Deputies of British Jews protesting against anti-Semitism in the Labour Party. He was in a counter demo which said Jeremy Corbyn has been unfairly smeared as an anti-Semite. A council spokesperson said he had been suspended while an investigation was carried out and that it “does not tolerate anti-Semitism”. His job includes inspecting private landlord properties. He does not work with social housing tenants. Mr Keable also works for union Unison, which said it is investigating and “takes allegations of anti-Semitism seriously”. Labour expelled Mr Keable last autumn for his role as the secretary of Labour Party Marxists. When contacted by the Standard, Mr Keable said: “I am sorry for any offence I may have caused. But the Nazi regime and the Zionist Federation of Germany collaborated, through the Haavara agreement, in the emigration of some 60,000 Jews to Palestine between 1933 and 1939.” He said he did not insinuate that Jews collaborated with the Nazis. In Defence of Stan Keable. 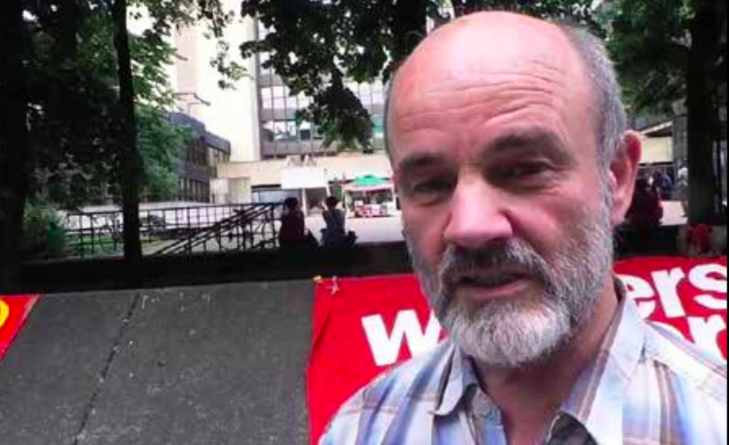 On March 27, the day after he attended the counter demonstration in Parliament Square, organised by Jewish Voice for Labour, Labour Party Marxists secretary Stan Keable was suspended from work by Hammersmith and Fulham council. The suspension letter states that there are “serious allegation(s) which, if substantiated, could constitute gross misconduct under the council’s disciplinary procedure” and which “could result in your dismissal from the council’s service”. Stan has not yet been informed of the exact nature of the alleged “inappropriate comments”. However, it seems very likely that they relate to a short video clip tweeted by BBC Newsnight editor David Grossman. It seems that Grossman – without asking for permission – filmed Stan on his mobile phone while he was talking to a supporter of the anti-Corbyn demonstration. Outraged Progress leader Richard Angell has called for Stan to be expelled from the Labour Party, only to be rather disappointed when somebody pointed out that he had, in fact, already been booted out under Labour’s witch-hunting rule 2.1.4.B. This automatically bars from membership anybody “who joins and/or supports a political organisation other than an official Labour group or unit of the party” and has led to the expulsion of dozens, if not hundreds, of Marxists and socialists, including supporters (or alleged supporters) of the Alliance for Workers’ Liberty and Socialist Appeal, as well as Labour Party Marxists. Somebody then alerted local Tory MP Greg Hands, who sprang into Twitter action, demanding that Hammersmith and Fulham “investigate and urge action. Enough is enough.” And they quickly did his bidding. Less than 18 hours after the demo, Stan was suspended by the council (which is run by Labour, incidentally). Stan replies: “No, I’m not saying that. Of course the holocaust was anti-Semitic. The problem I’ve got is that the Zionist movement at the time collaborated with them …” He then gets shouted down, while trying to elaborate that “the Zionist movement from the beginning” accepted the idea that Jews did not belong in Europe. There are a number of points to make about this conversation and the reaction to it. First of all, Stan’s comments were clearly part of a longer discussion and are taken out of context. Had he been properly interviewed or written an article, he could have explained more fully what he was trying to say. Of course, anti-Semitism by itself did not cause the holocaust. It existed long before the Nazis, eg, as promoted by the medieval Catholic church. The Nazi, at first, used anti-Semitism as a propaganda tool to link communists and social democrats together with finance capital. Both the labour movement and banking were supposedly dominated by Jews. There was an element of truth here – there were many Jewish communists and social democrats and more than a few Jewish capitalists. But, according to the Nazis, they were united in a world-wide conspiracy to rule the world. A form of social madness that led the Nazis first to ban the Communist Party (February 1933), then the trade unions (May 1933), then the social democrats (July 1933), then, in September 1935, this same ideology saw them introduce the Nuremburg race laws and, on November 9-10 1938, a full scale assault on Jewish owned businesses. It was, however, Stan’s comment that “the Zionist movement at the time collaborated with [the Nazis]” which has really got the right incensed. It was for this he has been labelled a “holocaust denier” online. You could criticise the slight factual inaccuracy contained within the words “at the time”, which implies that Stan meant during the time of the holocaust. But his attempts to clarify that he was talking about the Ha’avara agreement of 1933 between the Zionist movement and the Nazis (which broke the non-Zionist Jewish-led call for an economic boycott of the Nazi regime) was simply shouted down. This notorious agreement, however, is a historical fact. Most seriously though is the culture of fear around the question of anti-Semitism displayed by this episode. Stan’s suspension letter states that, “suspension is a neutral act and does not in itself constitute disciplinary action or imply guilt”. But even the briefest look at the clip should show the leaders of Hammersmith and Fulham council that there is nothing contained within those 105 seconds that could “bring the council into disrepute” or constitute “potentially a breach of the Equality Act 2010”. The right has been incredibly successful in creating a moral panic. By manipulating, by misrepresenting, by imputing, by lying the left can be charged with peddling a line which is supposedly anti-Semitic. Presumptions of innocence go out of the window in such a toxic atmosphere. Stan will now have to prove that he is not an anti-Semite or a holocaust-denier – not just to his employer, but also the thousands of people who have seen the reports and comments about the short clip (which has also been published by the Daily Mail – again without anybody approaching Stan, despite the fact he was clearly identified online). Marxists believe in open, free and robust debate. We believe such debate is absolutely crucial if we ever want to see a working class confident enough in defending and arguing its ideas to become the ruling class in society. Some say it would have been better to shut up when there might be a camera pointing at you. Of course, we have been advised to keep quiet about plenty of other things too: our open criticism of Jeremy Corbyn right from the day he won the leadership contest; our transparent reporting of meetings of the left; our analysis of disagreements between politicians in the Labour Party. You name it, we’ve been publishing openly about it. This is also reflected in the behaviour of our comrades at events: we do not shy away from debates, discussions. Even if that leaves us open to misinterpretation, wilfully or otherwise. That comes with the territory and there is only one way to avoid it: saying nothing at all. Something we are most certainly not going to do. This article was updated on April 2 to more accurately reflect the recording of the discussion at issue.